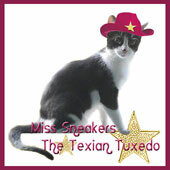 An early Thursday morning to everyone, from Miss Sneakers the Texian Tuxedo and I, Elvira Mistress of Felinity. We, along with many of our fellow Typepad platform users, are especially glad to be back among the blogging after a week of troubles the service had that will not be discussed further. April has not been the funnest of months for us and we will be glad to soon get rid of it until next year. Daddy Kiril is doing fine 2 wks. after his bit of excitement at work. Early Wednesday morning Sneakers & I had our beauty sleep rudely interupted by a bunch of firemen traising up and down the hallway, at 2am mind you, in search of the source of a whole lot of smoke. When one fireman came in our apartment we very prudently dived under the bed for the duration. It seems a human male, cooking a late meal, was clueless to a bunch of smoke his effort was causing. 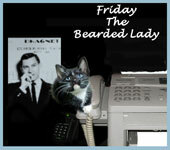 Before we get to the Easter round-up we wish to pay tribute to the memory of Meowza (March 11, 2004 – April 22, 2012), the beloved feline of Mog, the maintainer of the legacy that is Carnival of the Cats home page. Ms.Mog (Susan Strong) wrote a post, on anniversary Tuesday, and we hope you will stop by to lend support. Mog recently had surgery on one eye and is due to have it done on the other soon. 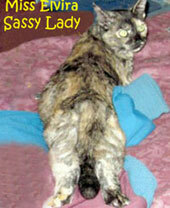 Please stop by with all the purrs and purrayers you can muster to speed her recovery! 1. Over at CatSynth...It's 2 cats vs 1 synthesizer! 2 and 3. Over at Brian's Home...Zoe tells what her sisters and brother Brian are REALLY like and they celebrate Easter. 4. Forever Home Wanted shares the news that "Be Kind to Animals Week" is coming soon! 5, 6 and 7. Over at Sparkle the Designer Cat...Take a quiz to learn what type of Human you have (We demand a recount as our result claims Daddy Kiril loves us TOO MUCH! ), learn about the book of rescue cat stories Sparkle's human has been editing and get a look at its cover ( my own story was considered for inclusion but didn't make the cut. ) and learn of a new book that Sparkle says reveals too many trade secrets, hee, hee (Daddy is addding it to his want list list!)! 8. 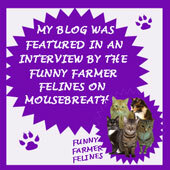 Over at Life From a Cat's Perspective...watch some cool gifs of the girls and Angel Maverick! 9. Animal Shelter Volunteer Life celebrates the news that...Tessa has been adopted! 10. Over at Traveling Cats...Cats of New York! 11. Over at Create With Joy...Who ate the kitten? 12. 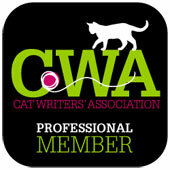 Over at Marian Allen's blog...Katya Graymalkin writes about the Queen Cat...HER! 13. Over at Rascal & Rocco...The dudes are a couple of real basket cases...Easter baskets, that is! Check out the pictures and the video. 14 and 15. Hannah & Lucy get all 'nippy and, once recovered, wish everyone a Happy Easter! Kitties, tell your human not to worry too much about his score on my quiz - quite a few VERY respectable humans got the same result! Poor Daddy Kiril just can't get a break; After his fainting at work recently, he's now got a cold and after getting off work at 11pm Friday has to be back at 7am Saturday, among his other worries as the 1st of May approaches. 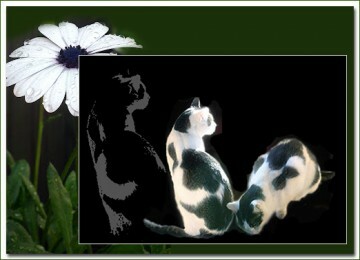 Thanks for the wonderful Carnival Of The Cats Elvira!! We miss Meowza, too!! He was such fun!! Lots of purrs and prayers going you way!! 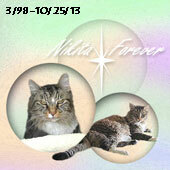 Thanks for a wonderful carnival and for remembering Meowza. It means a lot to me. The August dates are now taken so we only have to worry about October now. Looks like both Daddy Kiril and I have medical issues, I wish him well.